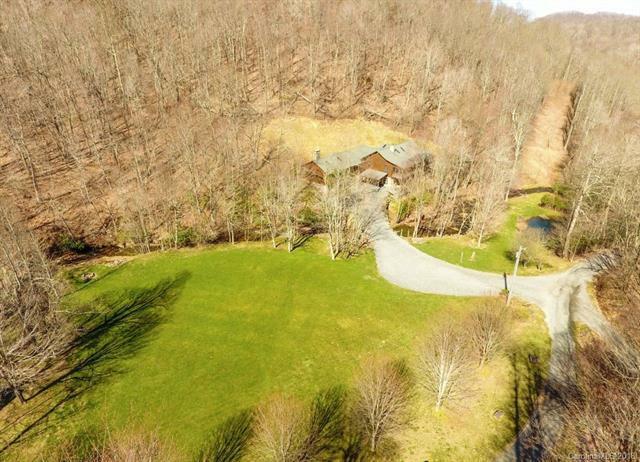 Private & Picturesque Mountain Lodge offering over 4100 sf of living space & 4br septic permit, on 30+ acres w/ large trout stream, detached 3 car oversized garage & finished multipurpose room, pond, pasture/field, heated bunk/camping house, & wood/equipment shed! Enjoy the sites & sounds of the rushing stream, Trivette Branch, making its way down into Howard's Creek! The Main Lodge includes an open great room, 3 BR/BA suites, office, bonus room, 2nd living space, & upper/lower wrap around decks. A breezeway off a back screened deck connects the main lodge to the 1100+ sq ft multipurpose room featuring a living/bonus space w/ vaulted ceiling, kitchen, & full bath! Amenities include: trout fishing, ample parking, hiking, skylights, wood floors, rustic accents/boulders, hot tub, private jetted tub in master suite, 2 stone wood-burning fireplaces (1 in main lodge, 1 in multipurpose space). Bunk house is heated w/ electricity and includes a detached Out House.